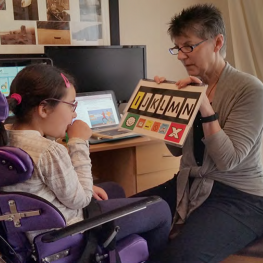 The session will include valuable video clips to illustrate each component and step to building actual reading skills (not emergent reading skills) for a variety of individuals with Rett Syndrome. Within the framework of the Balanced Approach to Reading, Guided Reading is a key component. Participants will learn how to teach students to actually do the reading versus only being read to. How to begin reading with a variety of readers from beginning to more skilled. identify different strategies that will work with a variety of girls with Rett to teach Guided Reading. identify appropriate low-tech communication solutions to support guided reading for a girl with Rett Syndrome. identify appropriate high-tech communication solutions to support guided reading for a girl with Rett Syndrome. utilize supplied books in order support a student with Rett Syndrome in the Guided Reading Block. identify a variety of strategies (from the video models) to help a student answer questions without increasing Apraxia.